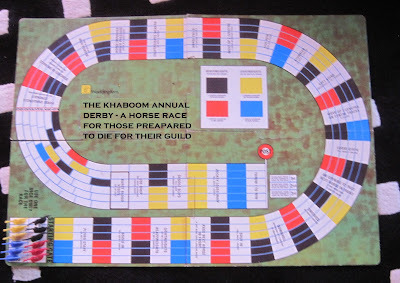 A horse race for those not afraid to die for their Guild! Competed for by novices selected to ride for the Warriors’ Guild, the Wizards’ Guild and the Merchants’ Guild. Only natural magic permitted. Each rider shall possess a riding crop and a dagger. Murder is allowed. Four horse per team; riders shall be connected telepathically. Players ger four jockeys each and play one of the three Guilds. All is fair in war and racing in Khaboom! Jockeys attributues will only be rolled when a saving roll is required. Daggers may be freely used on opponents and their horses. It is expected that the start will be utter mayhem!